Following my recent post about the SoundPoint phones, I thought I’d dig some more and refine them. First off, let’s make them sound Aussie. With a bit of digging, I was able to customise the dial, busy and ringback tones and cadences. In the process of testing this config I found I couldn’t get Lync to send me a busy signal (SIP 486) – the best I could get was SIP 480 (Temporarily Unavailable). So I added a “reorder” section to the config – just so I could hear what the busy tone sounds like. Here’s what you need to add to LyncSharedExample.cfg. Tweak as necessary, or to revise for other markets. 4. And finally, the key to getting it all working on this Voxilla forum post – you need to Branch to Silence, not to a Chord. Now let’s set daylight saving time (aka “DST”). The Aries phones prompt you to manually specify the time zone, but the SoundPoints are clever enough to pull the offset from DHCP (scope option 2). 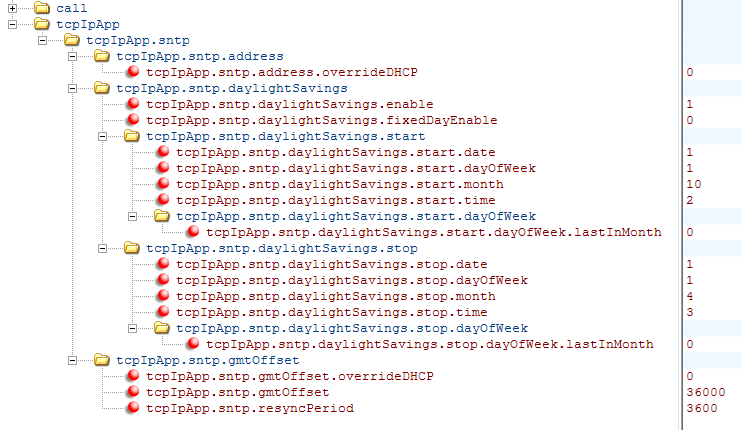 Alas, daylight saving we need to hard-code into the phone’s config file. We advance on the First Sunday in October each year at 2am, and revert at 3am (DST time) on the First Sunday in April. I’ve included the last line just in case you want to override the DHCP Scope Option 2 with a locally-held offset – although in this example it’s set to 0, so still relying on the DHCP server for the offset and ignoring the file’s value of 36000. The final attribute there (resyncPeriod) is how often the phone will check the time from the DHCP server. Every hour (3600) might be a little extreme: the Polycom PDF chose a value of 86400 (24 hours). n/a. You can strip the settings shown above, or alternatively, simply leave them there but disable them with “.enable=0”. 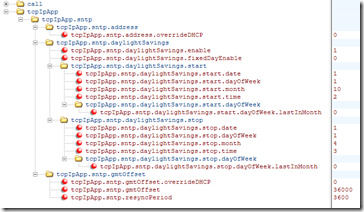 This sample shows DST values present but *disabled*. We’re still relying on the NTP server nominated by DHCP, but we’re adding a manual time offset instead of whatever might be offered by DHCP in its Option 2. BTW, whilst I’m obliged to place a “caveat emptor” warning on the above, the config *was* tested working against a DHCP server I mocked up in the lab and took forward to October 7th 2012 and April 7th 2013 and back several times. I found initially that Windows wouldn’t revert at 3am on the appointed morning. It seems that it needs to go through the transition from 1:59 to 2am first, and then at 3 it would behave as expected. (Here’s a quick NTP how-to if you want to do your own testing). Sorry – Hotlining excites me. Don’t know why. Here we now have a “Lync” phone that can be made to Hotline – to automatically call a preconfigured number when it goes off-hook. (And for the benefit of Google, I’ll refer to the alternate name of Private Line Automatic Ring-Down or PLAR). It’s pretty simple to do. 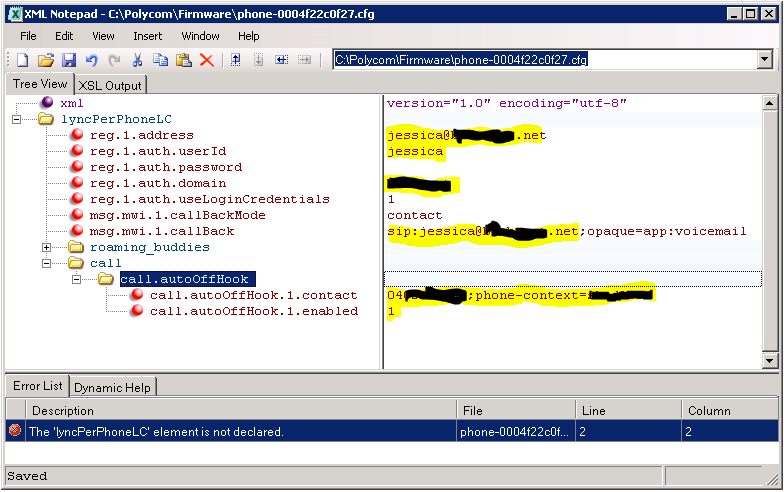 If you’re working with my earlier config, it’s as easy as adding the below text to the “phone-<macAddress>.cfg” file. Here’s what my sample one now looks like, pre-set to call my mobile when-ever it goes off-hook. Note that you now have to add the Dial Plan’s simple name to the end of the contact to be dialled (if it’s a phone number). 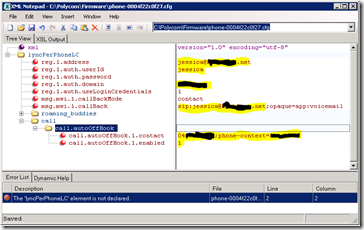 It seems that when you enable hotline, the phone no longer looks at the “dialplan.1.digitmap” we used in the LyncSharedExample.cfg file to build the outgoing number. So in this example, the “call.autoOffHook.1.contact” is set to “0270001234;phone-context=simplename” – and for the benefit of my international readers, that’s a vanilla Aussie number with area code & local number, which will require normalisation, hence the need for the Dial Plan’s simple name glued on as a suffix. Oct 17th, 2012: It’s here! The new software (4.0.3F) has landed. Early-adopters can download it from here. I’ve been trying to get the tones to work, and I can’t for the life of me get them to work properly. I have no issue with the dial tone, that one’s worked right from the start, but the ringback/ringing, I just can’t ever get to work, and I get the Yank long tone when waiting for the other end to answer. I saw there were issues with the se settings, and I thought maybe it was related to the firmware version I was using (4.0.1.13681), but I’ve just updated to 4.0.3.7562, and there’s no difference. Strangely, I found the examples at http://community.polycom.com/t5/VoIP/FAQ-How-can-I-change-my-Dial-Tone-or-Call-Progress-Tones-to/td-p/6490 don’t work either. I was wondering if you needed to factory reset or do anything similar to get it working. Have a read of this thread on the Polycom forum. The last two posts (mine and Steffen’s) have some REALLY useful advice. It looks like the fix is entirely based around whether you either start with a tone or silence, or you branch to same.